Riess spins this as voters turning toward the Democrats, but the numbers tell something of a different story, especially among the youngest voters. By far, the fastest growing political demographic among Millennials is "independent". Republicans absolutely need to look at these statistics and reevaluate where they want their party to go as we head into the 2020s. 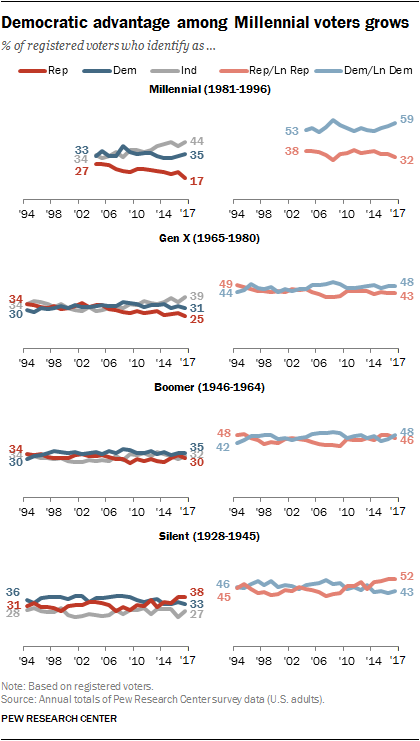 But Democrats also need to take a sober look at the numbers, and realize that if they continue to push toward the leftward extreme, these charts foretell their future as well.